Well, I am thrilled to be able to introduce myself here and let you all know how excited I am to be joining the team at Cycling Southland. I have been overwhelmed with the warm welcome and encouragement I have received from everyone .…. a true Southland embrace! Thank you! So, a little bit about myself ……. I grew up on the West Coast and in South Canterbury and then headed to University in Dunedin – all the while playing a plethora of sports. At the end of my law and history degrees at Otago I started riding a bike. The short story is, I fell in love with the sport and ended up embarking on a career in cycling which fairly comprehensively managed to take up the following 9 years of my life…funny how that happens! From 2004-2009 I raced on the road in Europe for the New Zealand team and also in the U.S for American teams. From 2004 I also represented New Zealand on the track, and consequently spent much time living in Invercargill, falling in love with the place and the people……the Southland spirit won me over fair and square! 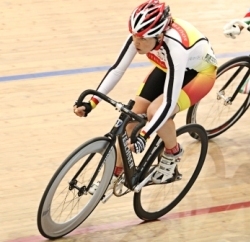 Track nationals this year was my final race. While I will always ride a bike, for me, it is time to finish racing and start concentrating on work and giving back to the cycling community. I absolutely love working with kids and I am really excited to be involved in this capacity. I also remember what it was like to start out riding on the track as an adult and understand the challenges and fears (and excitement!) involved, so I’m hoping I can encourage newbies to give it a go…..and consequently get some more people hooked on cycling! Cycling has provided me so many incredible opportunities and I have met many thousands of inspirational people – both here in Southland and all around the world. To be able to share some of the passion I have for the sport and the experience I have gained is a dream come true. I am looking forward to seeing you all out and about – come and introduce yourself!